Cryotherapy involves the application of a very cold substance onto an affected lesion in order to create a form of controlled burn. Liquid nitrogen at -195°C is the substance used for treatment of hand warts and verrucae at this practice. Liquid nitrogen is our preferred choice of substance as it is far colder than other substances available (nitrous oxide & ethers, acquired at pharmacies for self treatment). Since liquid nitrogen is much colder (at least x3 colder), it delivers a quicker and more effective burn, and consequently will provide higher rates of cure than commercially available products (when used by an experienced practitioner). A typical course of cryotherapy will involve up to three separate appointments at intervals of three weeks apart. 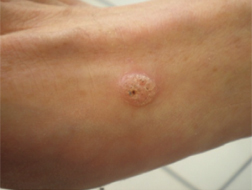 If after three treatments the wart/verruca had failed to clear, then cryotherapy would normally be discontinued and an alternative form of treatment considered. The majority of patients who receive cryotherapy on weight bearing verrucae will experience discomfort/pain during treatment, and some level of discomfort that will normally last for 1-4 days (possibly sufficient to cause a modest limp). 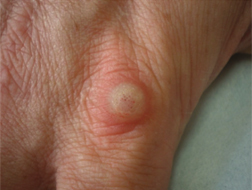 Hand warts are tolerated much better and will rarely cause any significant pain beyond 24 hours. SIZE OF AREA TREATED – the larger the surface area treated, the greater the levels of discomfort. PRESSURE APPLIED AT TIP OF PROBE – the more that pressure is applied onto the skin via the tip during the treatment, the greater the levels of discomfort. DURATION OF FREEZE – the longer the ‘freeze’, the greater the levels of discomfort. Average duration of freeze is between 10-30 seconds. SITE – verrucae frozen on weight bearing areas can be painful for several days if treated aggressively. Cryotherapy is generally used less aggressively on non weight bearing warts (where the skin is thinner) and therefore the duration and intensity of any pain is less pronounced and well tolerated in comparison to that on weight bearing areas. There is a limit to what we would consider to be acceptable for a patient to have to tolerate during and after the application of liquid nitrogen, this would be a throbbing foot and a limp that could last for several days. This would be the worst any one could expect and would only occur after freezing has occurred over a large & resistant verruca on a weight bearing area. Such treatment on very young children is therefore to be avoided where possible. Patients who have cryotherapy on a digit (finger or toe) can be given a local anaesthetic to numb the digit prior to treatment. This will ensure a painless treatment although discomfort will be experienced 2 hours after treatment when the numbing effect of the local anaesthesia wears off. What does it look like after cryotherapy? After cryotherapy the only visible signs will be localised inflammation that will become more pronounced after 24 hours. Cryotherapy undertaken on thin skin (e.g. tops of the hands, in between toes, top of the toes & feet) will probably form a blister after 24 hours, possibly a blood blister with more aggressive treatments, some blood blisters can be quite large. Verrucae on weight bearing areas rarely exhibit any obvious blistering due to the thickness of the skin and pressure exerted over the area when bearing weight. After approx 2 weeks the top layer of skin will probably ‘peel off’. It is important to consider that a ‘one off’ painless cure for verrucae does not exist, and although some verrucae will clear with one treatment of cryotherapy, some (mainly weight bearing verrucae) can prove very difficult to clear even after aggressive and painful cryotherapy treatments. Cure rates for cryotherapy are maximised when liquid nitrogen is used (it is much colder than other substances available). 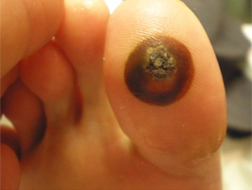 Children demonstrate higher rates of cure than adults, and the longer the wart/verruca has been present the more resistant to treatment it can become. The more aggressive the liquid nitrogen is applied the higher the cure rate. For warts anywhere other than on the weight bearing areas of the feet cryotherapy can prove very effective. 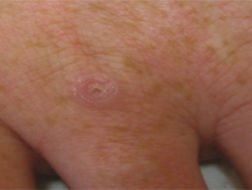 We can offer over 90% cure rates for warts on hands. 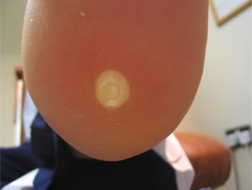 However warts on the sole of the foot (verrucae) are by far more difficult to clear with cure rates of 50-60% after three treatments. This difference in cure rates is due to the skin being much thicker on the soles than elsewhere. These rates of cure compare very favourably and reflect the level of experience and proficiency we are able to offer at this Practice. The cryotherapy clinics are held every third Friday afternoon by Mark Hollinshead. Mark treats hundreds of hand warts and verrucae every year and has done so since the Cryotherapy clinics were started in 1989. There is no need to tolerate the embarrassment of unsightly hand warts, or having to walk on an uncomfortable verruca. Simply make an appointment on one of our Cryotherapy/Wart clinics and let us do the rest.